Penicillium marneffei is an emerging pathogenic fungus that can cause a life-threatening systemic mycosis in immunocompromised hosts, especially in patients with AIDS. This infection is endemic in Southeast Asia. With the prevalence of AIDS in this area, the number of patients with systemic penicilliosis marneffei is found to be increasing rapidly in mainland China in recent years. We recently reviewed 668 cases of penicilliosis marneffei in mainland China from January 1984 to December 2009 in cnki, cqvip, CBMdisc and PubMed. We analyzed epidemiological and clinical features, laboratory findings, reaction to therapy and prognosis of the disease. We found that 99.4 % of the cases were reported in the southern part of China; among these cases, 42.8 % were from Guangxi (286 cases) and 40.6 % were from Guangdong province (271 cases). Five hundred and eighty-six cases (87.7 %) of penicilliosis marneffei were reported with infection by the human immunodeficiency virus, 25 cases (3.8 %) with other immunocompromised diseases, and 57 cases (8.5 %) without any documented underlying diseases. Fever, weight loss, anemia, lymphadenopathy, hepatosplenomegaly, respiratory signs and skin lesions were the common clinical manifestations of P. marneffei infections. The 569 cases received antifungal therapy with a mortality of 24.3 % (138 cases), 99 cases who had not received antifungal therapy had a mortality of 50.6 %. P. marneffei was an emerging pathogenic fungus and become a medical and public health importance in mainland China. The immunocompromised patients should pay more attention to P. marneffei infection in the endemic areas. We sincerely thank Prof. Glenn S. Bulmer for his assistance in English revision. This work was kindly supported by the Key Program of National Natural Science Foundation of China (U0932003). Li Jushang. Report of the first case of penicilliosis marneffei in China [in Chinese]. Zhonghua Yi Xue Za Zhi. 1985; 65(9): 533–534. Guo Qing, Deng Jinhui. Dermatomyositis complicated with Penicillium marneffeion pleural: a case report [in Chinese]. Chinese Journal of Dermatovenerology. 1992; 6(1): 35–36. Zhang Xiliu, Liu Meizhen. Febrile, cough, thoracalgia and pleural effusion [in Chinese]. Chinese Journal of Clinical and Experimental Pathology. 1997; 13(1): 71–72. Fu Rongming, Kong Jinxing, Bai Chunxiang. A case of penicilliosis marneffei [in Chinese]. Chinese Journal of Pathology. 1999; 28(5): 351. Pan Jian, Li Jushang. Clinical analysis of twelve cases of Penicilliosis marneffei [in Chinese]. Chinese Journal of Dermatology. 1999; 32(5): 353. Deng Zhuolin, Liu Xinmin. A case of AIDS associated with Penicillium marneffei infection [in Chinese]. Chinese Journal of Internal Medicine. 2000; 39(5): 348. Lei Yingquan, Wang Haiying, Ren Yusheng, Deng Zhengrong. Penicilliosis marneffei: two cases report [in Chinese]. Academic Journal of Second Military Medical University. 2001; 22(2):102,117. Li Li, Li Ming, Zhang Baoqing, Mi Hongying, Li Xianzhen. Penicilliosis marneffei misdiagnosed to bronchopneumonia: a case report [in Chinese]. Chinese Journal of Misdiagnostics. 2001; 1(10): 1594. Li Songwen, Xiao Yang, Lai Riquan. A case report of penicilliosis marneffei [in Chinese]. Journal of First Military Medical University. 2001; 21(11): 874. Lu Changming, Zeng Fanqing, Xi Liyan, Lin Baozhu, Xie Suisheng. Three cases of penicilliosis marneffei [in Chinese]. Chinese Journal of Dermatology. 2001; 34(5): 395. Wang Luxia, Xu Dexing, Liu Haiying, Luo Chunmei, Liu Reng. A case of AIDS associated with Penicillium marneffei infection [in Chinese]. Journal of First Military Medical University. 2001; 21(5): 371. Zhong Huixiu, Meng Wenhong. One case of Penicillium marneffei cultured by bone marrow [in Chinese]. Shanghai Journal of Medical Laboratory Sciences. 2001; 16(4): 252. Zhou Xianyi, Yu Nasha. Itraconazole therapy of one case of Penicillium marneffei infection [in Chinese]. Chinese Journal of Dermatology. 2001; 34(5): 406–407. Liao Xiaomei. One case of AIDS merged with disseminated penicilliosis marneffei [in Chinese]. Chinese Medical Journal. 2002; 82(5):325–329. Miu Zuohua, He Jue. 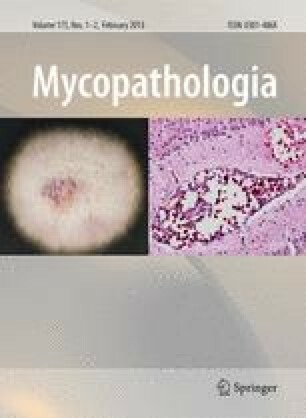 Clinical and pathological analysis of nine cases of penicilliosis marneffei misdiagnosed by histoplasmosis [in Chinese]. Journal of Gannan Medical College. 2002; 22(499–501. Zhou Xianyi. Penicillium marneffei infection after renal transplantation: a case report [in Chinese]. Chinese Medical Journal. 2002; 82(11): 761. Cui Xu, Ma Hongbing, Liu Weiping. AIDS patient complicated by disseminated Penicillium marneffei infection: a case report and review [in Chinese]. West China Medical Journal. 2003; 18(2):233–235. Liu Lan, Tian He, Shu Xiaojing. A case of penicilliosis marneffei [in Chinese]. Journal of Bethune Military Medical College. 2003; 1(4): 252. Lu Changming, Chen Qin, Xi Liyan, Xie Suisheng. Systemic Penicillium marneffei infection: a case report [in Chinese]. Journal of Rare and Uncommon Diseases. 2003; 10(2): 61–62. Wan Haizhen, Huang Guicai, Gao Hui, He Liyan, Liu Fengqiong. Two cases of AIDS patient merged with Penicillium marneffei infection in bone marrow [in Chinese]. Chinese Journal of AIDS & STD. 2003; 9(2):123. Yi Jianyun, Jiang Yueting. A case of AIDS associated Penicillium marneffei infection [in Chinese]. Chinese Journal of Clinical Laboratory Science. 2003; 21(4): 255. Zhang Meide, Chen Zhengrong, Zeng Rongxin. Penicilliosis marneffei: a case of autopsy attached [in Chinese]. Journal of Modern Clinical Medical Bioengineering. 2003; 9(4): 350–351. Bi Xinling, Wang Ying, Gu Jun, Zhang Lijuan, Yan Ming, Li Xiukai. Penicilliosis marneffei by symptoms of gut firstly [in Chinese]. Chinese Journal of Dermatovenereology. 2004; 18(1): 47–48. Deng Li, Zhang Meide, Zeng Qiang, Ye Qici, Jiang Wenhui, Yu Jialu,Li Yingjie, Gao Yan. Clinical and pathological analysis of Penicillium marneffei infection in children: report of two cases [in Chinese].Chinese Journal of Practical Pediatrics. 2004; 19(4): 233–234. Hou Zhe, Ma Yanhua, Luo Lan, Zheng Hui. A case of AIDS patient merged with Penicillium marneffei infection [in Chinese]. Chinese Journal of Nosocomiology. 2004; 14(9): 1076. Li Lei, Liu Weiping, Cui Xu, Li Gandi, Jiang Wei, Meng Wenghong. Two cases of AIDS merged with disseminated penicilliosis marneffei [in Chinese]. Chinese Journal of Pathology. 2004; 32(2):185–186. Li Yun, Chen Yan, Li Xuemei. Clinical analysis of three cases of severe Penicillium marneffei infection [in Chinese]. Journal of Military Surgeon in Southwest China. 2004; 6(2): 87–88. Liao Wanzhen, Hu Yi, Hu Xuefei, Sun Aidi, Yu Yang. A case report of Penicillium marneffei infection [in Chinese]. Chinese Journal of Nosocomiology. 2004; 14(2): 229–231. Lu Zhaohui, Liu Hongrui, Xie Xiuli, Wang Aixia, Liu Honghua. Penicillium marneffei infection [in Chinese]. Chinese Journal of Pathology. 2004; 33(6): 536–540. Xi Liyan, Lu Changming, Zhou Xianyi, Wang Luxia, Xie Suisheng. Penicillium marneffei infection in Guangdong Province China: clinical analysis of 15 cases [in Chinese]. Chinese Journal of Dermatology. 2004; 37(8): 455–457. Xie Qiang, Lu Changming, Lin Min, Xi Liyan. One case of AIDS merged with penicilliosis marneffei [in Chinese]. Acta Academiae Medicinae. 2004; 13(1):30. Zhang Meide, Chen Zhengrong. A case report of AIDS-associated penicilliosis marneffei on child [in Chinese]. Chinese Journal of Diagnostic Pathology. 2004; 11(5): 355. Zheng Wenjun, Yan Yilin, Wei Gao, Su Jiaguang, Liu Donghua, Li JUshang, Pan Shangling. Five cases of AIDS with penicilliosis marneffei [in Chinese]. Chinese Journal of Dermatology. 2004; 37(4): 202. Zhu Shuyuan, Zhu Qiongyuan, Li Yun, Zheng Qin, Xu Su. Three cases of disseminated penicilliosis marneffei [in Chinese]. Chinese Journal of Clinical Laboratory Science. 2004; 22(2): 157–158. Guo Xiaojing, Kang Mei, Zheng Qin. Clinical manifestation and laboratory diagnosis of four AIDS merged with disseminated penicilliosis marneffei cases [in Chinese]. West China Medical Journal. 2005; 20(4):734. Hao Jin, Ye Qingqiao, Yan Heng, Zhong Baiyu, Yang Xichuan, Tang Shuqian, Deng Jun, Hao Fei. One case of AIDS merged with disseminated penicilliosis marneffei [in Chinese]. Journal of Clinical Dermatology. 2005; 34(5):302–304. Liao Wanzhen, Peng Weihua, Sun Aidi, Yu Yang, Chen Kaisen, Li Jing. The first case of AIDS merged with penicilliosis marneffei in Jiangxi Province [in Chinese]. Jiangxi Medical Journal. 2005; 40(10):614–617. Liao Wanzhen. Penicillium marneffei: a death case report of systemic infection [in Chinese]. Acta Academiae Medicinae Jiangxi. 2005; 45(2): 129–130. Xia Xiujiao, Tao Maocan, Shan Yunyun, Zhwng Junhui, Xu Aie. A case of disseminated cutaneous penicilliosis marneffei [in Chinese]. The Chinese Journal of Dermatovenereology. 2005; 19(8):489–490. Xu Qingfang, Lai Wei, Lu Chun, Gu Youshou, Su Xiangyang, Zhang Yuqing, Liu Qi. A case of penicilliosis marneffei [in Chinese]. Journal of Clinical Dermatology. 2005; 34(9): 609–610. Yu Jiang, Li Jun, Dai Zewei, Lu Xiaojun, Jiang Nenggang, Shi qing, Guo Xiaojing. A case of AIDS associated with penicilliosis marneffei and differential diagnosis with common pathogen [in Chinese]. Sichuan Medical Journal. 2005; 26(1):85–86. Yuan Chunwang, Zhao Dawei, Li Jingying, Zhao Xuan, Wang Wei, Jia Cuiyu. A case of AIDS associated with penicilliosis marneffei [in Chinese]. Journal of Clinical Radiology. 2005; 24(12):1114–1115. Zhang Xiliu, Nong Jiang. Clinical diagnosis and analysis of two AIDS merged with penicilliosis marneffei cases [in Chinese]. Chinese Journal of Clinical and Experimental Pathology. 2005; 21(1):81–83. Chang Dong, Jiang Wei, Zhang Yunjie, Huang Zhihong. Penicillium marneffei septicemia: a case report [in Chinese]. Chinese Journal of Nosocomiology. 2006; 16(2): 273. Deng Xilong, Chen Wanshan. Clinical analysis of AIDS with Penicilliosis marneffei in lung [in Chinese]. Journal of Tropical Medicine. 2006; 6(7): 782–784. Huang Xiaojie. One case of AIDS merged with disseminated penicilliosis marneffei [in Chinese]. Chinese Community Doctors. 2006; 23:28. Huo Na, Wang Guiqiang, Yu Yanyan. A case of AIDS associated typical penicilliosis marneffei [in Chinese]. Chinese Journal of Practical Internal Medicine. 2006; 26(23): 1909–1910. Lan Mei, Lin Jinying, Ren Yongwei, Zhu Xia. Diagnosis and treatment analysis of four cases of AIDS with penicilliosis marneffei [in Chinese]. Shanxi Medical Journal. 2006; 35(3): 359–360. Li Xiqing, Xi Liyan, Lu Changming, Li Jun, Zhang Junmin. Clinical analysis of eleven cases of AIDS with penicilliosis marneffei [in Chinese]. Chinese Journal of Dermatology. 2006; 39(8): 436–438. Li Shunfan, Huang Wenming, Wu Guofeng, Li Wen, Fan Yiming. Disseminated penicilliosis marneffei [in Chinese]. Journal of Clinical Dermatology. 2006; 35(7): 461–463. Lu Hongzhou, Shi Jianguo, Shen Yinzhong, Tong Haitao, Wang Jiangrong. A case of AIDS patient merged with Penicillium marneffei infection [in Chinese]. Microorganism and Infection. 2006; 1(3): 157–160. Mo Ranghui, Tang Xiaoping, Cai Weiping, Chen Xiejie, Chen Wanshan. Clinical analysis of forty-one cases of AIDS with disseminated penicilliosis marneffei [in Chinese]. Chinese Journal of Practical Internal Medicine. 2006; 26(24): 1953–1955. Wang Wenlong, Yang Xu, He Xinge, Xu Yun, Chen Limin. Analysis of cases of with disseminated penicilliosis marneffei [in Chinese]. China Medical Engineer. 2006; 14(5): 500–503. Yu Guoqiang. Two cases of AIDS associated with penicilliosis marneffei [in Chinese]. Chinese Medical of Factory and Mine. 2006; 19(3): 277. Zhu Wenke, Lu Puxuan, Liu Yan, Ye Ruxin, Zhou Boping. CT diagnosis of AIDS with disseminated penicilliosis marneffei [in Chinese]. Chinese Journal of Medical Imaging Technology. 2006; 22(5): 745–747. Cai Qizhi, Zheng Xiujin, Ye Linfeng. AIDS associated-Penicillium marneffei on by symptoms fever and hepatic lesion firstly [in Chinese]. Chinese Journal of Practical Internal Medicine. 2007; 27(19): 1554–1555. Huang Wentan, Peng Xiaomei, Wu Qiuxia, Gong Zhifeng, Xu Biyun, Zeng Xi. Osteolysis caused by Penicillium marneffei: a case report and review [in Chinese]. Chinese Journal of Difficult and Complicated Cases. 2007; 6(7): 409–411. Li Qin, Zhao Qi, Wang Chunxin, Xiao Chenyue, Hu Zhigang, Shen Bo. The first report of patient with AIDS combined penicilliosis marneffei infection in Jiangsu [in Chinese]. Chinese Journal of Dermatovenereology. 2007; 21(6): 357–358. Lu Sihan, Han Jiande, Chen Wanshan, Hu Rongxin, Chen Xiejie, Lai Yingrong, Song Weinan, Chen Zhihao. Clinical analysis of AIDS with penicilliosis marneffei [in Chinese]. Journal of Sun Yat-sen University (Medical Sciences). 2007; 28(3): 310–313. Jiang tong, Zhou Cunjian, Zhong Baiyu, Li QInjie, Ye Qingyi, Wang Li, Ge Lan, Hao Fei. Diagnosis and treatment for disseminated Penicillium marneffei infection discovered by oropharynx swab in a non-HIV patient [in Chinese]. Acta Academiae Medicinae Militaris Tertiae. 2007; 29(11): 1110–1112. Mo Shengfu, Ning Gang. Penicillium marneffei infection associated with meta-high acidophile cell on a child according to bone marrow checking [in Chinese]. Guangxi Medical Journal. 2007; 29(12): 1996. Tang Shuqian, Ye Qingjia, Zhong Baiyu, Li Qinjie. Laboratory diagnosis of penicilliosis marneffei: a case report [in Chinese]. Chinese Journal of Dermatovenereology. 2007; 21(12): 760–761. Tang Zhirong, Lu Zhenzhen, Liu Wei, Chen Jie, Hu Yueying, Deng Xaioe, Liang Weixian, Yang Jinye, Lu Guogan. Treatment of AIDS with Penicillium marneffei infection in Guangxi Province [in Chinese]. Journal of Applied Preventive Medicine. 2007; 13(1): 28–30. Yang Shaomin, Zhang Mi, Li Zhenglun. Penicillium marneffeion infection checked by blood and bone marrow: two cases report [in Chinese]. Journal of Laboratory Medicine. 2007; 22(3): 239–240. Zhang Yindi, Liu Zhengyin, Zhang Hongweim Li Taisheng. Clinical analysis of seven cases of AIDS with Penicillium marneffei infection [in Chinese]. Chinese Medical Journal. 2007; 42(5): 48–49. Zhong Hua, Zhao Wenli, Meng Gang, Ma Qiaoyu, Zhang Yong, Hao Fei. Discussion of clinical case [in Chinese]. Chinese Journal of Mycology. 2007; 2 (5): 296–299. Cao Hang. Clinical analysis of three cases of AIDS with penicilliosis marneffei [in Chinese]. Modern Medicine & Health. 2008; 24(12): 1755–1756. Ceng Yulan, Lin Jing, Tang Xiuwen. AIDS associated penicilliosis marneffei: ten cases of clinical and pathological characters analysis [in Chinese]. Chinese Journal of Clinical and Experimental Pathology. 2008; 24(3): 334–336. Deng Hui, Li Dangyu, Fu Peng. Misdiagnosed analysis of thirteen cases of penicilliosis marneffei [in Chinese]. Clinical Misdiagnosis & Mistherapy; 2008. 21 (6): 44–45. He Renliang, Liang Zhiyuan, Zhang Yili. One case of AIDS merged with disseminated penicilliosis marneffei misdiagnosis by hepatitis [in Chinese]. Chinese Journal Mycology. 2008; 3(6):351–353. Li Can, Liang Xin, Ma Weiguo. Clinical analysis of twenty-one cases of AIDS with penicilliosis marneffei [in Chinese]. Internal Medicine. 2008; 3(6): 989–990. Li Houmin, Sang Juhua, Li Ruoyu, Liu Yanchun, Zhang Jianzhong. AIDS patient complicated by disseminated Penicillium marneffei infection [in Chinese]. Journal of Clinical Dermatology. 2008; 37(4):229–231. Li Lihua. Clinical analysis of six cases of AIDS with penicilliosis marneffei [in Chinese]. Academic Journal of Kunming Medical College. 2008; 29: 348–350. Li Linghua, Tang Xiaoping, Cai Weiping. Clinical analysis of 101 cases of AIDS with penicilliosis marneffei [in Chinese]. Chinese Journal of AIDS & STD. 2008; 14(1): 12–14, 20. Liao Wanzhen, Peng Weihua, Hu Xuefei, Sun Aiti, Yu Yang, Li Jianchun. AIDS combined with penicilliosis marneffei and malignant lymphoma: the first case report [in Chinese]. Chinese Journal of Nosocomiology. 2008; 18(7): 1038–1040. Luo Ming, Cao Yalu. One case of AIDS merged with penicilliosis marneffei [in Chinese]. Journal of Jinan University (Natural Science & Medicine Edition). 2008; 29(2):217–218. Tang Zhenxiang. Clinical analysis of fifty-two cases of AIDS with Penicillium marneffei infection [in Chinese]. Chinese Journal of Dermatovenereology. 2008; 22(5): 291–292. Wu Hangang, Liang Kecheng. Clinical analysis of seven cases of Penicilliosis marneffei [in Chinese]. Guangxi Medical Journal. 2008; 30(5): 752–753. Zhan Yi, Su Yuwen, Yang Shengbo, Wen Haiquan. Penicilliosis marneffei [in Chinese]. Journal of Clinical Dermatology. 2008; 37(1): 28–29. Zhang Xiaoling, Liu Yuemei, Huang Junyun, Lioa Changfeng. Two reports and reference reviews of Children penicilliosis marneffei [in Chinese]. New Chinese Medicine. 2008; 39(10): 676–677. Huang Yanqiong, Liang Caisong, Mo Yulian. Health education of thirty cases of AIDS with penicilliosis marneffei [in Chinese]. Internal Medicine. 2009; 4 (6): 979–980. Huang Aiqiong, Ye Hanhui, Huang Zhengqiu, Wang Zhengwu, Li Shengcong. Clinical analysis of twenty cases of AIDS with penicilliosis marneffei [in Chinese]. Fujian Medical Journal. 2009; 31(2): 7–9. Liu Baorong, Ye Hanhui. Clinical analysis of fifteen cases of AIDS with penicilliosis marneffei [in Chinese]. Fujian Medical Journal. 2009; 31(3): 51–52. Mo Ranghui, Li Lun. Misdiagnosed analysis eighteen cases of AIDS with disseminated penicilliosis marneffei [in Chinese]. Clinical Focus. 2009; 24(14): 1252–1253. Ou Ruzhi, Lu Xiangchan, Li Weixin, Li Xueqin. Intracalvarium infection caused by Penicillium marneffei: a case report [in Chinese]. Shandong Medical Journal. 2009; 49(41): 12. Yang Lin. Clinical analysis of three cases of AIDS associated with Penicillium marneffei infection [in Chinese]. Journal of Kunming Medical College. 2009; 9: 143–144. Zhang Lanling, Yang Ling, Zhou Fuyuan. One case of disseminated penicilliosis marneffei [in Chinese]. International Medicine & Health Guidance News. 2009; 15(17):49–50. Zhang Yong, Su Lingsong, Lv Qing. Clinical misdiagnosed analysis of thirty-six cases of AIDS with penicilliosis marneffei [in Chinese]. Chinese Journal of Misdiagnostics. 2009; 9(13): 3137. Zhuang Shuquan, Bai Jianpeng, Xu Baiye. Analysis of primary immunodeficiency diseases associated with penicilliosis marneffei [in Chinese]. Modern Journal of Integrated Traditional Chinese and Western Medicine. 2009; 18(32): 3993–3991. The most Chinese consummate databases. Available from http://www.cnki.net, http://www.cqvip.com and http://www.ncbi.nlm.nih.gov/pubmed. Case reports we used are shown in appendix references. China Ministry of Health (CMOH) & World Health Organization (WHO) A Joint Assessment of HIV/AIDS Prevention, Treatment and Care in China. Beijing: State Council AIDS Committee Office; 2007. http://www.chinaids.org.cn/n435777/n443716/appendix/Joint_Assessment_EN.pdf.